This week, I had the chance to e-interview Teri. These are the straight-up answers from a beautiful, young, biracial woman who is really rocking amazing curls. Light-skinned-ed Girl: This is a question we always ask on Mixed Chicks Chat to kick things off: What are you? Teri: I'm half black and half white. My mom's black and my dad's white. Light-skinned-ed Girl: You say on your website that you struggled for years with your hair-how so? Teri: During the school year, I was raised by my dad in an all white neighborhood, in a predominantly white school (there was one other black person in the entire school). Even at family get-togethers on my dad's side, I was the only person of color there. No one anywhere seemed to have hair like mine. Things others around me could take for granted turned out to be big ordeals for me because of my hair. 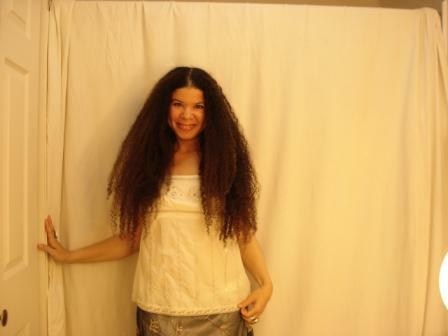 And it was my hair that came to symbolize my otherness to me. My hair didn't act like anyone else's hair. I couldn't get a comb through it like everyone else could with theirs, if I swam, it turned into a big matted nest, it wouldn't grow because it was breaking off, and it looked like a big dark cloud instead of lying flat and behaving. I didn't know what to do with it, and no one else did, either. I was deeply ashamed of my hair, and was constantly at war with it. Light-skinned-ed Girl: Have you ever straightened it or relaxed it? Teri: When I lived with my mother, she straightened it. So when I began spending the school years with my dad, I continued the tradition. ll I knew was if my hair was this difficult to manage with a relaxer in it, I was too afraid to find out what my hair was capable of at full strength. Unfortunately, I had no idea what I was doing when I did relax it, so I was always walking around with scabs on my head after I permed it. One time I even managed to dissolve most of my hair. It was after that I became addicted to weaves and extensions--I could finally buy the hair I'd been desperately wishing for my entire life. In fact, I didn't know what my natural hair looked like until I was in my mid-twenties, when I finally decided to grow out the chemicals. Light-skinned-ed Girl: How did you figure out what worked for your hair? Teri: It was a slow and graceless process. I did everything wrong, and when none of those things worked, the only options left were the ones that happened to work. I went through this trial and error process for every step of caring for my hair I learned. I have an innate ability to choose all the wrong things first. So I ended up learning everything the hard way. At my hair's expense. Light-skinned-ed Girl: What made you decide to put up a website? Teri: The biggest reason is that I didn't want anyone else to suffer through thirty years of hating their hair like I did. Especially when all they need is to learn a few basic things, and they could have hair they loved. I see little mixed girls in the store with that big cloud of tangled-up hair, and a white mom, and my heart goes out to both of them. I wanted a way to help them. And it seems so many books and sites for African-American hair either recommend chemicals or extensions (even for children! ), or some form of time-consuming alteration. Caucasian books lump all curly hair together with generic advice that doesn't work for our tight curls. So I haven't seen anything out there for those of us with tightly curled hair, who want to wear the curls we are born with. Also, people kept coming up and asking me how I got my hair the way I did, and there was so much to tell them! I wished I could direct them to a place with all the basic information. There is still so much information I've discovered that I've put it all in a book Biracial Hair: How To Grow It Long, How To Make It Happy. I'm hoping to have the book out by September. Light-skinned-ed Girl: The best thing about your website is that there are step-by-step instructions Why did you decide to do that? Teri: When I was searching for answers, there were none out there. I put the answersin a step-by-step format because these are the exact things I do that makes my hair happy. And for many, the way to care for curly hair isn't intuitive. We have been flooded by the media's images of how hair "should" behave and be treated, and it seems no matter what race the person portrayed is, their hair is behaves and is treated like straight hair. Very curly hair must be treated like very curly hair. But there is little information on exactly what that should be. Plus, I'm very literal. I presented the information in the way I would need to have it explained to me. Light-skinned-ed Girl: How long did it take for your hair to grow so long? It's beautiful! Teri: Thank you! I'm such a goofball, I just measured my hair to see how long it is, and my hair got tangled on the metal tab of the tape measure. It's about 28" long. I'd say it took five or six years to grow out virgin hair to this length. I'm pretty sure it's at it's maximum length now, even though my mom thinks it looks longer every time she sees me. Light-skinned-ed Girl: Who do you hope to reach with your website? Have people written you with stories about their hair? Teri: I just had someone from Germany email me and ask for hair advice.That was exciting. She even sent in photos of her hair, which I enjoyed seeing. I guess I'm a curlaphile—I love seeing tightly curled hair and I love talking about it. I'm working on putting up a page for comments and questions/answers on my site. I'd love to answer more questions and talk directly to people about their biracial hair and their experiences with it. In some ways, I've put up the website, as well as written the book, for the me of thirty years ago. 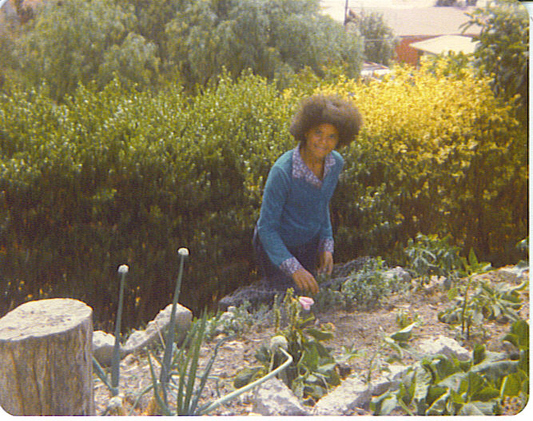 All that self-hatred I once felt because of my hair (and took out on my poor hair) could have been prevented. I'm hoping to save anyone with hair like mine from what I went through. My hair used to fill me with such shame and frustration that I'd be in tears every time I had to wash and comb it. Now it's my friend, and I think it's my best feature. I'm also hoping to help straighter-haired parents of biracial, or transracially adopted, children who may have no idea how to take care of such curls. I know first-hand what it's like to be raised by people who not only have no idea what to do with such hair, but also don't really understand what the big deal about it is (or why it hurts so much to comb). Hair can be so much more to us than just hair. I believe that once we learn to love the hair we are born with, we can love all of who we are. It would make me so happy if I could help turn misunderstood hair into something that makes sense, and can even bring joy to its owner. Then all those heads of my hair I destroyed in my youth would not have been in vain.